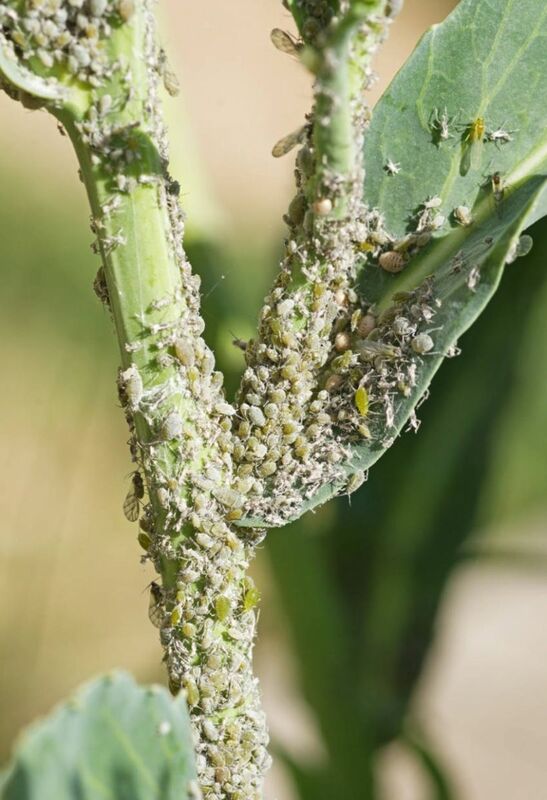 Of all the common garden pests, aphids are perhaps the most familiar and widespread. 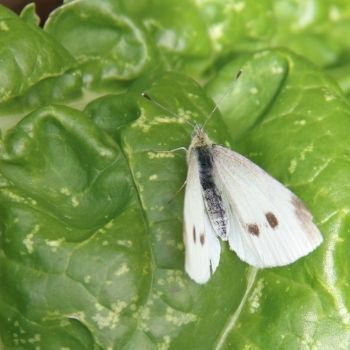 Feeding on the juicy sap of tender plants, they can multiply incredibly quickly, infesting complete plants and spreading throughout a garden within days. The physical damage of feeding weakens a plant, stunting its growth and even killing it eventually. Aphids excrete a sweet, sticky substance known as honeydew. As this builds up on a plant, it hampers photosynthesis and carbon dioxide absorption, further weakening it. 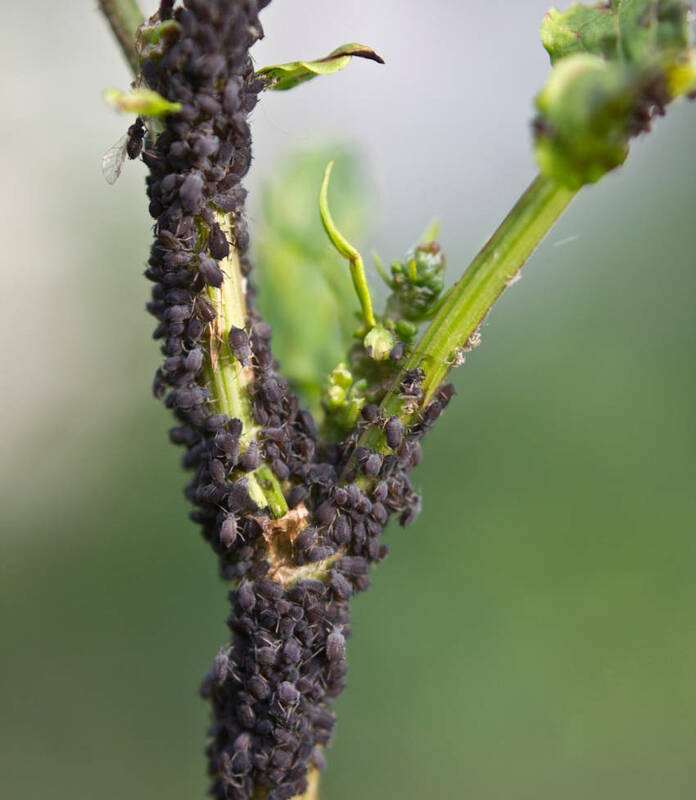 Perhaps most damagingly, aphid populations spread viruses and other diseases when moving from plant to plant and garden to garden. Clearly, none of this is good news for a gardener, so any infestation needs to be detected and dealt with as soon as possible. Although they come in many varieties, aphids are generally 2-4mm in length, with fragile, translucent bodies. Most individuals are wingless, although later generations of a population grow wings in readiness to spread once the colony is outgrowing its food supply. The most common aphids are greenfly and blackfly, although they can also come in white, brown, grey, yellow, or pink. They tend to congregate on the undersides of leaves, especially targeting tender young growth. 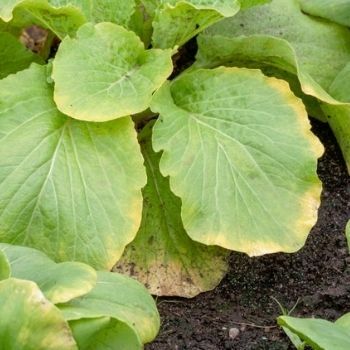 From a distance, the first signs of an infestation may be wilting or curling leaves, sometimes followed by yellow spots. However, on closer inspection, the individual insects are easy to see and an infestation will be obvious. The aphid family contains around 4,000 members worldwide, and they feed on a wide variety of plants. Whatever you grow, it's likely you'll be faced with an infestation at some point. Thankfully there are several straightforward ways of dealing them. 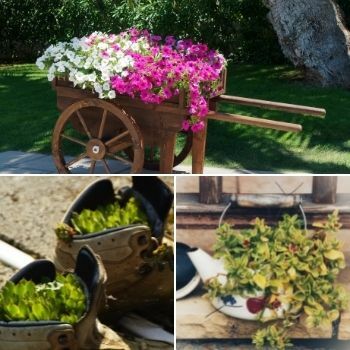 While there are plenty of commercial products available from nurseries and hardware stores, some organic and some not, most gardeners are at their happiest using homemade, improvised, and sustainable methods. So here's what to do. The greatest predatory foe of an aphid is the ladybird. A typical adult bug can get through around 5,000 aphids a year, and so encouraging a healthy population is highly effective. 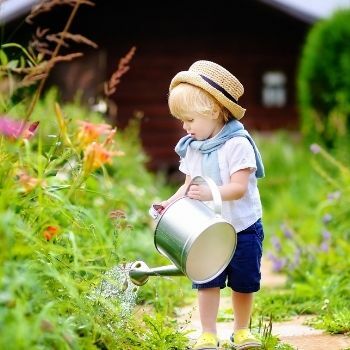 Make your garden as ladybird-friendly as possible by growing plenty of their favourite herbs and flowers, particularly alyssum, yarrow, geraniums, and tansy. 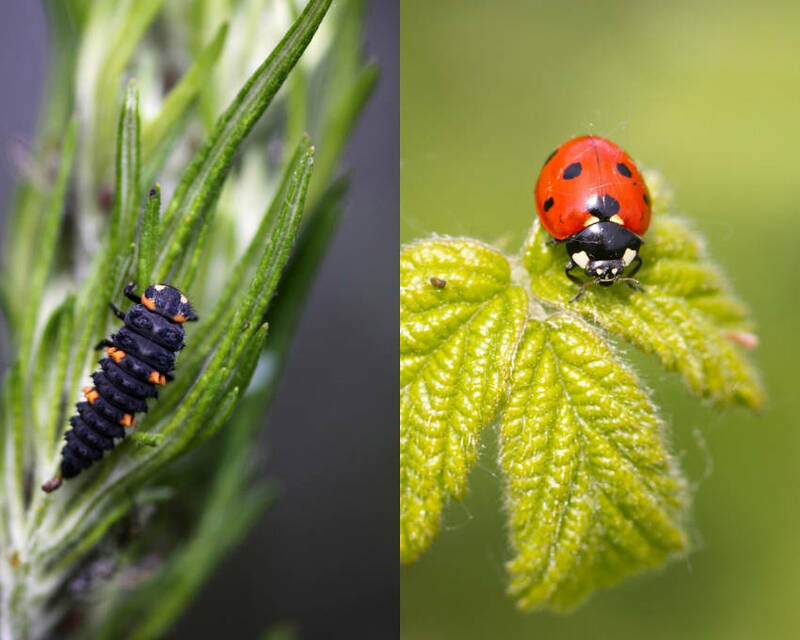 It's important to note that ladybird larvae are just as enthusiastic aphid consumers as adults, each one dispatching around 400 flies between hatching and pupating. You can recognise the larvae from their dragon-like appearance, so if you spot them prowling around your plants, make them welcome rather than panicking at their alien looks. Attracting ladybirds to your garden will also encourage lacewings, hover flies, and many beneficial species of wasp, all of which can play a supporting role in keeping the aphid population under control. But you can also enlist botanical allies the fight against aphids. Companion planting can help in two ways. Aphids favour some plant species more than others. Grow these insect magnets next to your main plants and they'll work as decoys, attracting any aphids in the area and hopefully leaving your prize specimens relatively untouched. Particular aphid delicacies include calendula, nasturtiums, mustard, and basil. 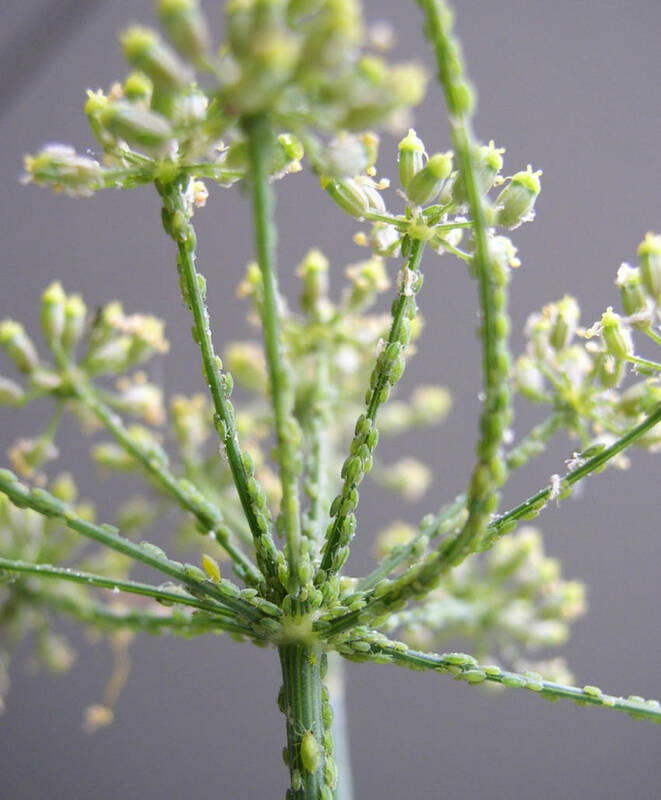 If you use these plants as aphid traps, be sure to check them regularly for infestations, so you can clear the inhabitants before they become too firmly established. Companion planting can also work in the opposite direction. Some plant species release aromas or chemicals which actively repel aphids, encouraging them to lay their eggs in a more enticing location. Examples of these plants include catnip, radish, chives, garlic, marigold, petunias, and coriander. But if your prevention efforts fail and you find a growing infestation, it needs to be dealt with quickly. Mechanical methods are the quickest and easiest. For an immediate effect, dust aphid eggs, larvae, and adult flies off affected leaves with a soft brush, or squirt them off with a hose or garden spray. Once dislodged to the soil below, most surviving insects are unable to find their way home. This method can be improved by sprinkling infested areas with wood ash a few hours beforehand, making the aphids heavier, less mobile, and easier to dislodge. A more direct approach is to simply squash the insects between your fingers. This works in two ways. Clearly, squished aphids are in no position to do any more damage. 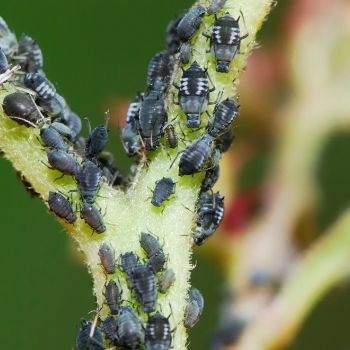 But perhaps more importantly, the carnage releases chemicals which warn other aphids of danger, making your plants a less welcoming place to settle. For more squeamish gardeners, a less gruesome but still effective method is to wrap sellotape around your fingers, sticky side outward, and gently wipe the aphids away. You can buy commercial aphid sprays, but there are two homemade solutions which can be equally effective but also kinder to the environment. Mix 1-2 tablespoons of mild domestic or horticultural soap with one litre of water to make a homemade spray. For a little extra oomph, add a pinch of cayenne pepper. Make a solution of isopropyl or rubbing alcohol, watering it down to about 35% alcohol by volume. Optionally, add a little soap to help the liquid stick. Both of these sprays should be used every two to three days on affected areas of the plant. However, it's sensible to test homemade sprays on a sacrificial plant first, leaving it for a few days to check for any negative reactions. Be aware that even the most gentle and organic spray can also harm beneficial insect wildlife, so use with a light touch. If you're still suffering an aphid onslaught, try some of these other methods which many gardeners swear by. Place yellow sticky traps near to target plants to attract and capture aphids. These traps can be bought easily enough, or made at home by smearing petroleum jelly across a sheet of yellow plastic. However, these traps are just as likely to catch ladybirds, lacewings, and other friendly insects, so use with care. Use aluminium foil as an unconventional mulch underneath affected plants. The idea is that because aphids tend to feed on the underside of leaves, the reflected light shining from below confuses them and deters them from establishing. Fill a bright yellow dish with soapy water and place it near the plants you want to protect. The bowl's colour plays on aphids' attraction to yellow flowers, while the soapy water takes advantage of their poor swimming skills. Protect particularly tender, young crops with horticultural fleece. Some species of ants appear to 'farm' aphids, protecting them from predators and consuming their honeydew excretions. If you suspect this is happening, consider planting ant-deterring plants such as tansy, rosemary, or lavender. Lastly, aphid populations can overwinter on leftover plants or debris in the veggie patch. A thorough autumn clean-up can help get the new growing season off to an aphid-free start. In small numbers, aphids are part of a healthy ecosystem and cause no real damage, so don't panic if you spot one or two. But an infestation can quickly get out of hand, so once you spot a problem developing, it pays to attack it on all fronts.